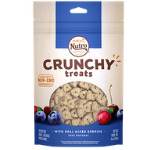 Has your dog tasted NUTRO® Crunchy Treats With Real Mixed Berries? They’re delicious, natural dog treats. Perfect for training dogs, our natural dog treats have the flavor of real blueberries, cranberries and cherries. They contain no wheat or corn. So, you can feel good giving your dog this special snack.